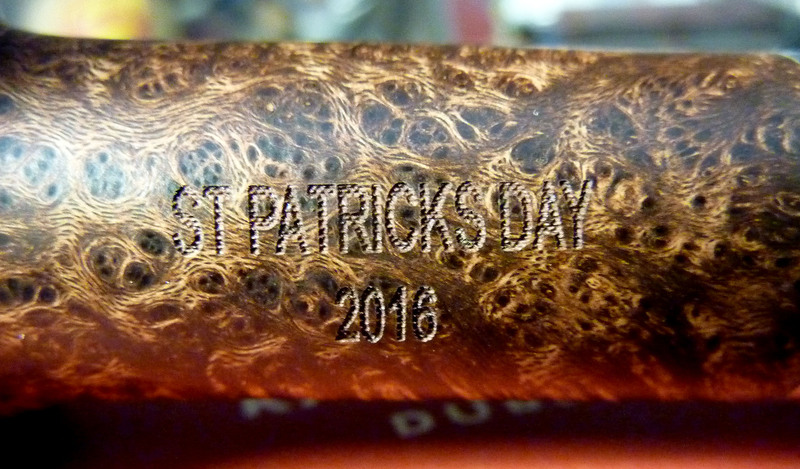 They’re here – the 2016 St. Patrick’s Day pipes! Actually, they’ve been around for quite a while. 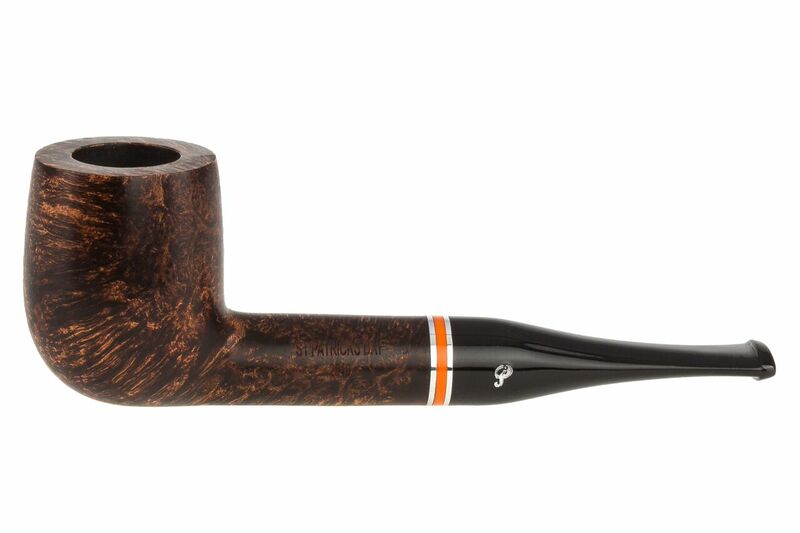 I don’t hear from him anymore, but one of Conor Palmer’s initiatives at Peterson has been to get the annual collectibles like the St. Pat, the Christmas, and the Limited Edition – Pipe of the Year out much earlier than has been the case in the past. When I talked to Tony Whelan at the factory a few weeks ago, he said they’d finished up with the 2016 St. Patrick’s Day pipes quite awhile ago. For those who follow IPCPR news, Conor had them on display last June at the show. 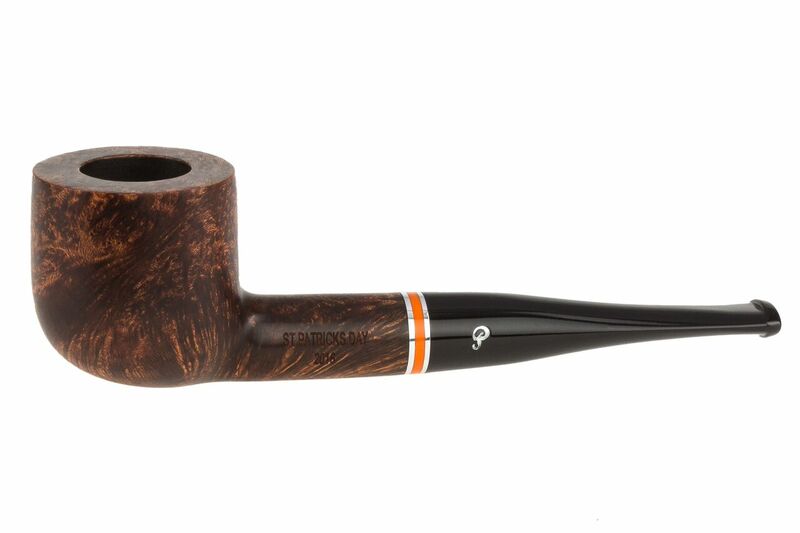 In any event, they’ve only been rolling out on the internet in the past few weeks, and in a serendipitous conversation with Renia Carsillo of Tobaccopipes.com (where the pipes are already available), she offered me the use of their amazing photographs of the new series of twelve pipes. This year there’s a special treat, the “Tank L” or Large Tank or whatever you want to call the poker shape that was released as part of the Mark Twain 2010 set. I like this version’s slightly-bent mouthpiece better than the original’s straight. If you’ve been reading this blog for any length of time, you’ll remember me saying that Peterson’s special collection shapes trickle down over time from their original release to the annual collectible lines before they disappear. This is always an exciting time if there are favorite shapes, because once the raw material is gone, the shape will normally disappear from the catalog. I picked up really nice renditions of the B35 Kaffir from the 2009 Antique Collection in its 2013 smooth and 2014 rusticated Christmas releases. 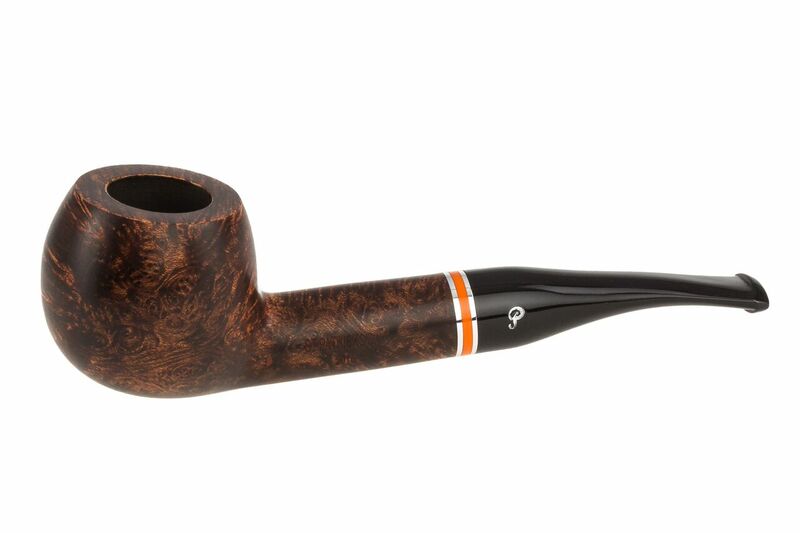 This year’s St. Patrick’s Day pipe features a new dark amber with brown contrast matte stain that makes the grain really pop. From a look inside the mortise, it appears the pipes were dip-stained, which should make for a much tastier break-in period. 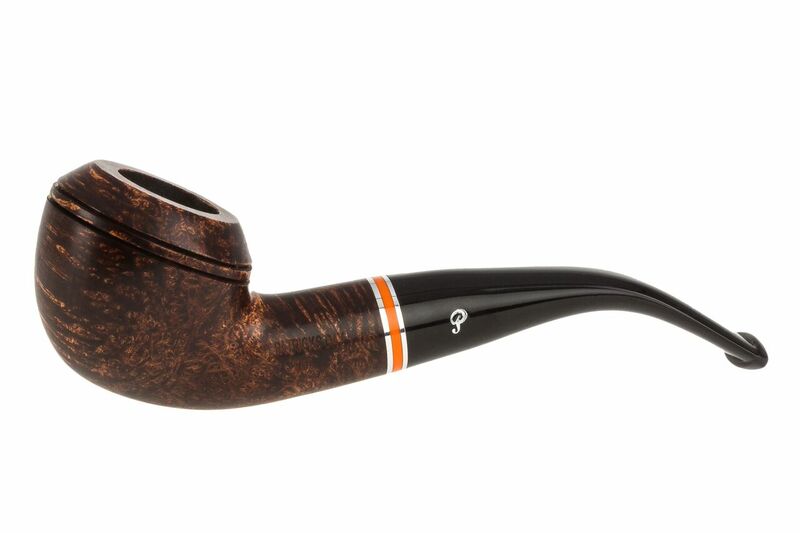 The shank’s trim band is nickel with orange acrylic, the first time this has been done since the beautiful tri-color from the original issue in 1998. 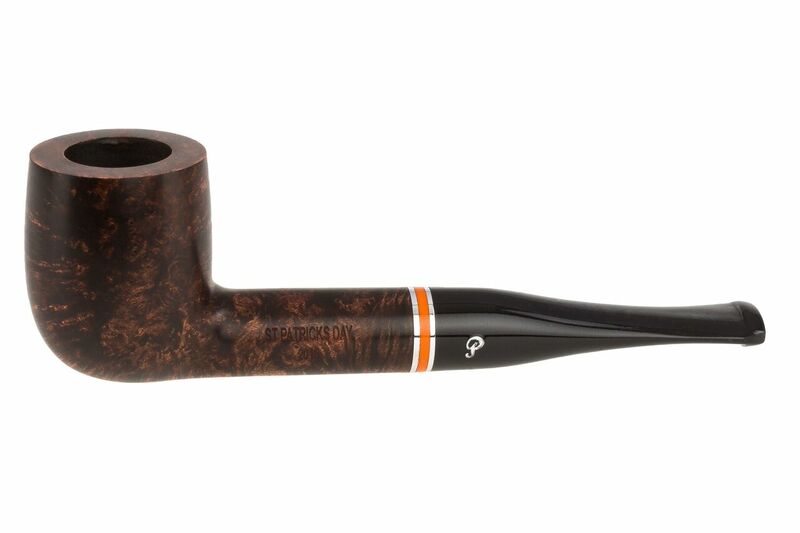 The stem—huzzah!—is vulcanite for a very comfortable change, with a hot foil P.
Interestingly, and maybe the harbinger of things to come, while the series is laser-stamped ST. PATRICK’S DAY over a smaller 2016, there is no shape number stamp and no PETERSON’S or PETERSON’S OF DUBLIN stamp. I know they haven’t put shape numbers on the high-grade Craftsman line, but I’m surprised to find the omission here. As usual, the St. Patrick’s Day comes in a collectible sleeve. Hold onto that ephemera, Peterson collectors! 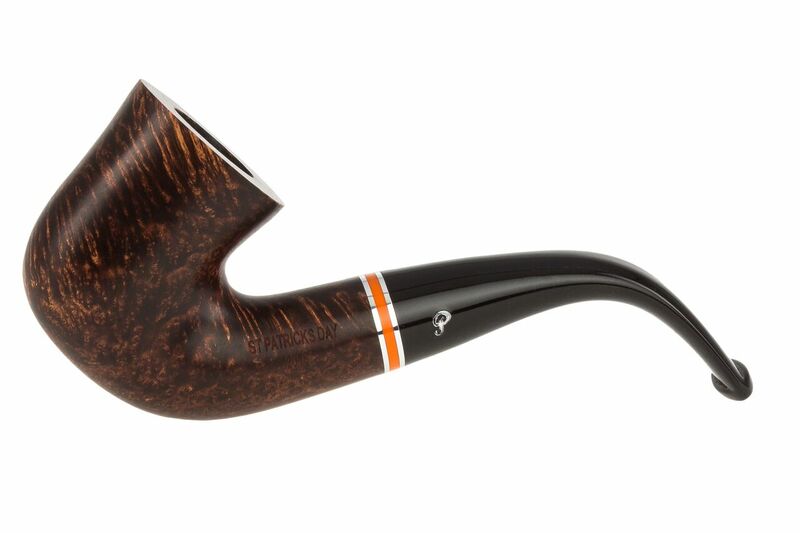 I think the trick with any Peterson shape is to find it with a grain pattern or finish that will keep you picking it up and smoking it. 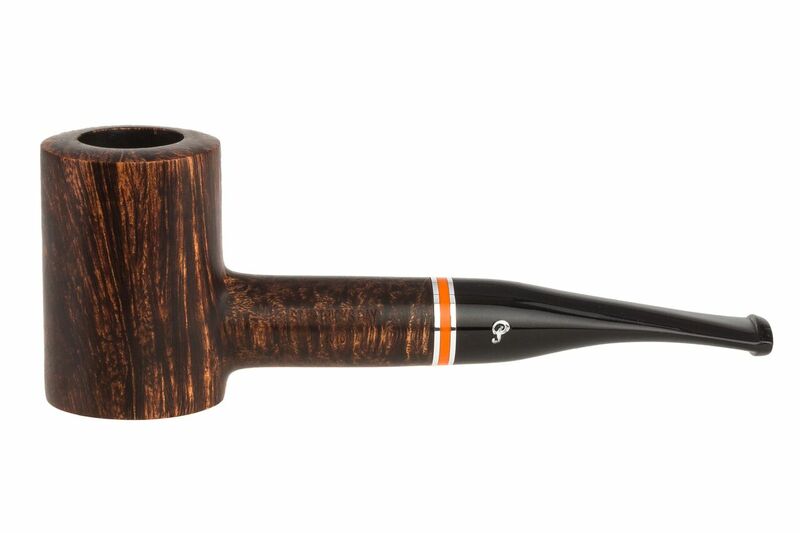 When I was looking for one of the new St. Patrick’s Day Tank Ls I had a really unpleasant conversation with an extremely well-known east coast retailer / e-tailer when I asked him (over the phone) to help me pick out one with good birdseye or straightish grain. After he got done with his Peterson slugs, I almost asked him why he sells the marque if he detests it so much. Then I remembered there’s always going to be Peteophobics out there to slam Peterson, for as long as long as I’ve been smoking one, which is amazingly unjustified once you have an understanding of what Peterson is offering and how they make it, or even the slightest inclination to compare like-to-like. 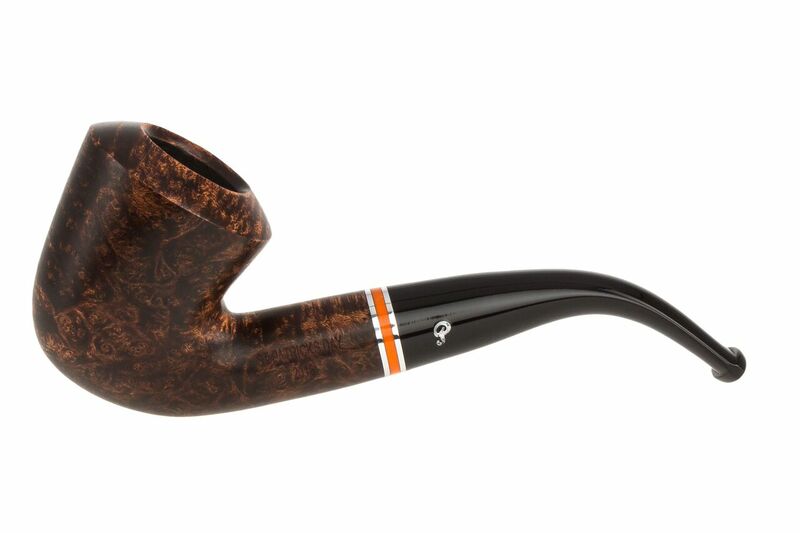 My advice is to call, email or set up a chat with Renia Carsillo or anyone at Tobaccopipes.com. 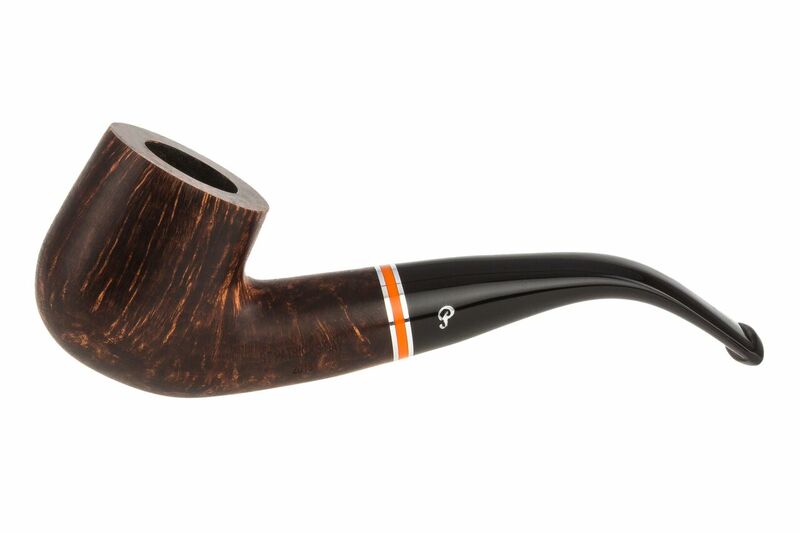 They’ve got several in each shape and will be happy to make photos of the available pipes in the shape you’re looking for. I bought the Tank L.
I’m enjoying some Irish Flake in it even as I write this reply. The Vulcanite stems got my attention! 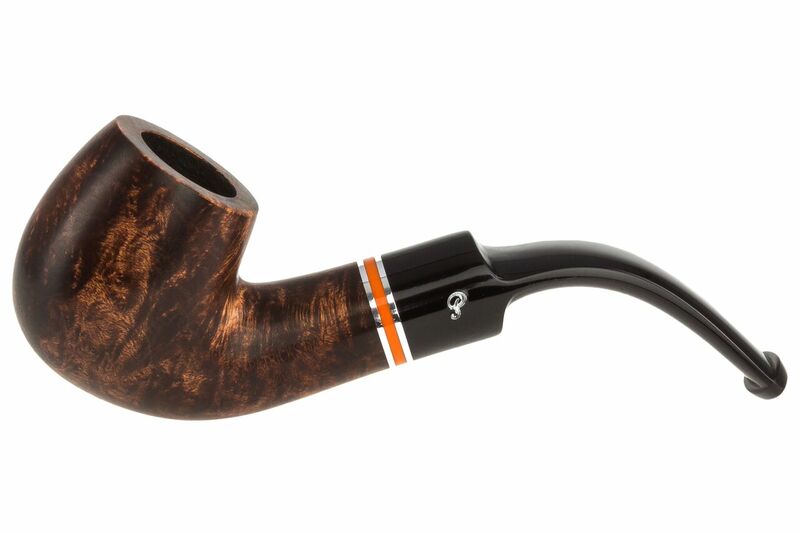 Very nice looking pipes at a great price! How is this different from the Dalkey? Is it the stain being a little different? I’ve been wanting a Dalkey for awhile now, though I prefer acrylic stems. And may go ahead and pick up one of the St Pat Day pipes. But the similarity leaves me a little confused. Good question. It’s the stain color, not the trim ring. Look at the Dalkey line–“hazelnut” is the word commonly used to describe it. It’s what I would call an orange medium-contrast, luster (not matte) finish. BTW, if anyone has bought a new St. Pat, let me know if yours has a stamp number. Tony at the factory says they’re stamped with shape numbers, but none of them show up on the photos I received from Tobaccopipes.com, and mine doesn’t have one. I checked a bunch of the ones we have and, from what I can see, some do have the shape stamp and some don’t. I can’t pick out any pattern to this. However, even when they do it’s difficult to see in a picture. If that is important to someone, I would suggest they call and ask us to pick one with the stamp for them. Tony at the factory says they are all supposed to have shape stamps. I am always curious about all things Peterson, and wondered if the new laser-stamping meant an end to shape stamps. 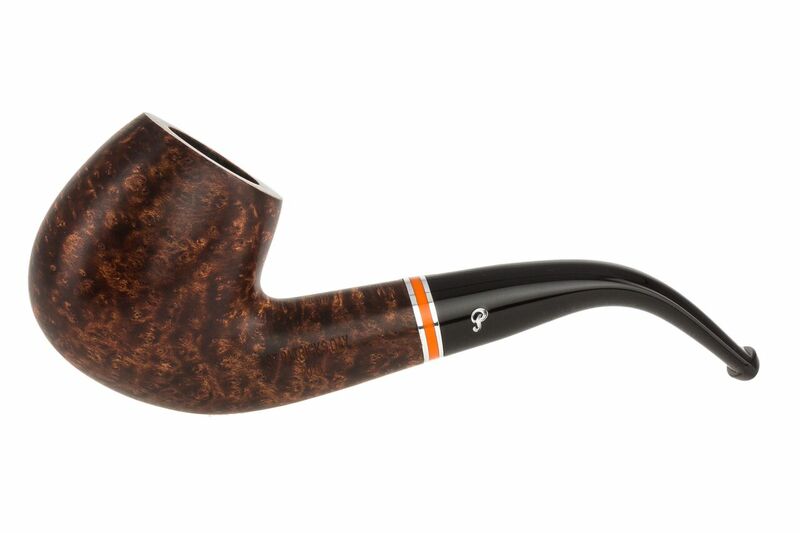 I confess I’m also a little disappointed there is no “Peterson’s” stamp–but I don’t know the rationale, and I certainly don’t make my living making pipes, so I don’t really have any complaint, do I? 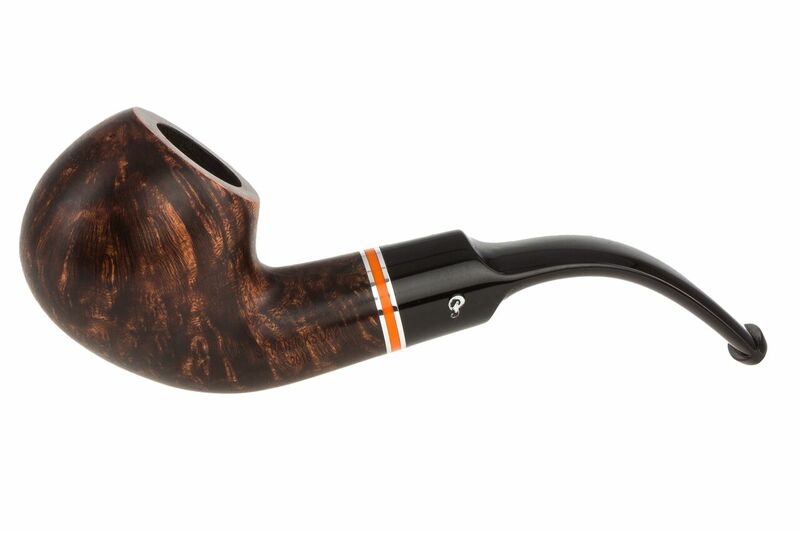 In the meantime, I really like the high-contrast stain chosen for this year’s pipes. Great write up. We’re enjoying the 2016 St. Patrick’s Day pipes and can’t wait to see what’s coming next.